I was was a little surprised by the question, as my students love them. They get excited by them because they know where they’re headed and if they make a silly mistake it means they haven’t got the right answer and know to check through to find the mistake (often with my year 13s it’s something really silly because they’ve rushed, such as a plus sign becoming a minus sign or a daft arithmetical error such as 2×3=5!) (nb that’s an exclamation mark, not a factorial sign). The discussion on the podcast was interesting, but it was accepted by all four members of “the panel” that students do hate them. It really got me thinking, are my students weird? Is it something to do with the way I teach them? I know my students tend to love the subjects I love and, as mentioned here, have often picked up my preferences for methods. Have I drilled my students in such a way that I’ve made them love these questions? Perhaps I have, but I think that’s a good thing. They are the questions where you can be sure to eliminate silly errors, so if you have the mathematical ability, you should have the marks. I was fascinated by the discussion though, Dave suggested that the hatred could be built from the myth that maths has a right or wrong answer. This is a myth that I find irksome. It’s a total fallacy and yet people who lack knowledge about maths assume this to be the case. We’ve all had those comments “ha, marking? You’ve got it easy, just tick or cross right? !” These negative perceptions of maths are often passed on by parents, and sometimes by teachers of other subjects! I think this could be due to their own experiences of the subject. This is something that needs to change, Maths is about a LOT more than right or wrong, as maths teachers we need to work on this. I’ve touched on this before here. During the discussion Dave also suggested that, as we are interested in the mathematics more than the correct answer, perhaps we should have maths tests where the correct answers actually have no marks attached, where all the marks are attached to working. This is something that I find intriguing. It can be infuriating to have to give full marks to an answer with no working (it could be a guess!) but give another pupil only half the marks despite perfect working because they copied a number wrong from one line to the next. I would, however, worry about how the marks are awarded. As we know, there can be many equally correct ways to get to the right answer, and all would need to be able to get the same marks, otherwise we wouldn’t be testing mathematical ability, rather we’d be testing the ability to guess what’s on the markschemes! Do you have a view about Dave’s proposal? Do your students like those show that questions? I’d love to hear your views/experiences. For a long time I’ve been confused about straight lines. Not because they confuse me, or that I don’t understand them, but the prolific use of the formula y-yo = m(x-xo). I personally prefer the y = mx +c version, and I couldn’t see a benefit to y-yo at all. I certainly couldn’t fathom why at A Level is was so heavily favoured by teachers and markschemes alike. I had asked around a few times, and the only coherent point I had got that made any sense to me was that when the gradient is fractional students who weren’t any good with fractions could multiply up by the denominator and deal with integers more easily. But my experience showed me that students used y-yo in a mechanical manner, and weren’t building any deep understanding of the geometry of straight lines. I then noticed, while reading his blog at flying colours maths, that Colin Beveridge (@icecolbeveridge) was very heavily on the side if y-yo, and called y=mx+c “the baby formula”! I thought, perhaps “Colin can explain why there’s such a preference.” I asked, and sparked another “blog off”. Which version do you prefer? Do you have any strong views? I’d love to hear them. Recently my Year 11 class have been doing a lot of work around graphs. Not plotting graphs, but the stuff that comes under the banner of “further graphs”, so recognising, sketching and transforming quadratics, cubics, logarithmic graphs, exponential graphs and everyone’s favourite trigonometric graphs. I hadn’t taught it to a KS4 class before, so I had a good long think about it and created some new resources, and rejigged a couple from A Level classes! You can see all the resources on TES here. I started off with a match up, I gave them a number of graphs and the equations they matched too, some they had met before, some they hadn’t, but I gave them calculators and whiteboards and 15 minutes to have a crack at it. The class responded really well to this and a number of them managed to correctly match up all the graphs to the equations without any help whatsoever. The rest of the lesson was spent sketching and solving quadratics, they had touched on this before, but were glad to revisit it. The next lesson was spent on cubics, sketching and solving and becoming familiar with the shapes, and how to factorise ones with a constant term of zero. The next lesson was spend on transforming graphs, this was a lesson adapted from my A level class and it worked well, the class fully getting to grips with graph transformations. To finish the unit I then did the lesson from the standards box on trig graphs. They also responded well. I’ve not use all the activities from the standards box, but I have always found the ones I have used have gone well! These lines are taken from the phenomenal opening to Ian Stewart’s From here to infinity, and I think they contain some very powerful imagery and sentiments about maths that are often missed by a lot of people. Recently I was at a university open day for a psychology course and are one point, for a small scale taster “study” we were asked to put ourselves into groups based on Kirton’s Adaption Innovation theory. The lady running the session then discussed adapters and innovators (more info here). She said that adapters were people who liked order, liked to stick to rules and innovators liked to look creatively at problems, deconstruct them and try other approaches. All of which was fine, but then she said “adapters tend to be accountants, or something else mathematical.” I bit my tongue, I could see it might hold for accountants, but not mathematicians! And to lump accountants and mathematicians together in such a way….. Mathematics IS creativity, it’s about looking for answers. When teaching an intro to complex numbers I talk about Hero, Bombellini and Co and the work they each did, the fact they couldn’t answer certain questions within the confines of what was already known, so they “invented” the complex plane. Mathematicians have been creating for millennia. It’s what maths, especially pure maths, IS. This idea is something I’ve been thinking a lot about recently. Not least because I’ve seen some fantastically creative mathematics from a few students recently. One Y11 girl who is a gifted mathematician but has missed a lot of lessons was tackling a proportion based problem on a mock. She had missed the lessons on proportion, but still had an attempt. She didn’t do it the way I’d taught, and actually went an incredibly long way around, but she got the right answer. She saw a question she’d not encountered before, and she solved it. That’s the sort of mathematician we need to train. These are brilliant examples of the creativity of maths, and we need to change the way maths is viewed, perhaps it’s down to the curriculum, perhaps it’s down to the pedagogical style many of us encountered at school, perhaps it’s down to the focus on the C grade threshold pass, or perhaps it’s a combination of them all. Yesterday someone tweeted “for those of you who haven’t found 2048 yet, here’s a link: http://gabrielecirulli.github.io/2048/ ” (I tried to find the tweet again but couldn’t). I hadn’t found it yet, but had seen plenty of people mention it on twitter, so I followed the link and found the game. It took me a while to work out what was going on, at first numbers just seemed to appear and change at random, then I realised that you needed to match tiles which were the same and they’d add together, adding this to your score. Thus you end up with tiles containing powers of 2. 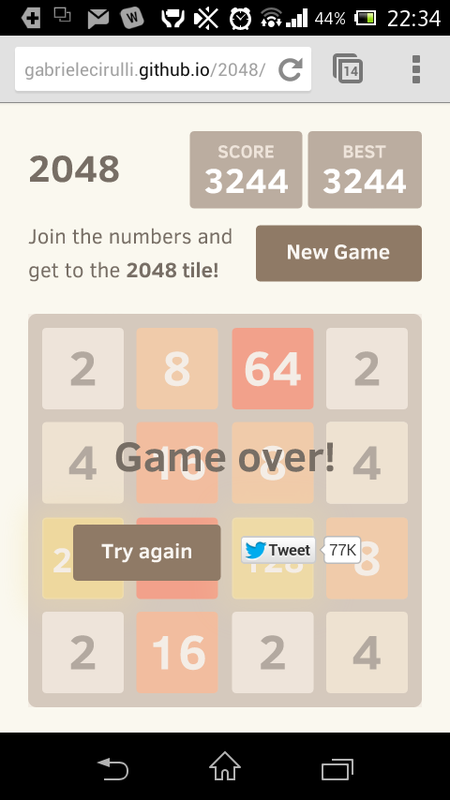 I haven’t managed to get the 2048 tile yet, but I imagine given the name of the game that it’s possible, and probably where the game stops. What happens if you don’t manage to get the tile is that the game finishes when the board becomes full and no adjoining tiles have the same value. 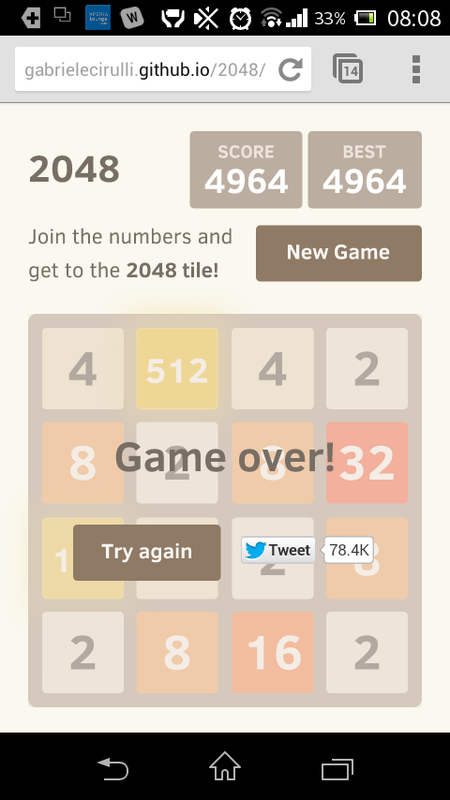 A score of 4964 and a high tile of 512. I’ve not worked out much of a strategy yet. I’ve been trying to look a few moves ahead and set up chain matches, and that seems to have improved the score, but I’m pretty sure with some further thought there are even more ways I can improve. I was also thinking if the benefits educationally to the game. It certainly encourages strategic and logical thinking and provides a better familiarity with powers of 2. Perhaps a project on it may produce some interesting results. Today I was observing an NQT and the lesson was on compound interest. His question to introduce the subject was “if you invested £1000 at 10% apr for 3 years how much would you have at the end?” I thought it was a great way to introduce it and it’s similar to what I do, although I must never have used that combination of numbers, because I noticed something rather interesting that I’d never noticed before. Have you noticed what I did? At this point in the lesson I thought, it’s Pascal’s Triangle! I quickly checked the next number and of course I came up with £1464.10. I then realised that the place value of our decimal system would mean it would go a bit skewiff here after. Any compound interest problem can be reduced to a binomial expansion problem! c x (1 + i)^n where c is capital, i is interest (as a decimal) and n the number of periods. I know that this will be known by some already, but I had never made this link before and found it fascinating, and hope you do too. It’s just another example of the beauty and connectivity of maths. I’d love to hear if you have ever used this link before, or if you yourself have noticed anything cool like this. Circle Theorems: Should we bother? On the most recent edition of “Wrong, but useful” cohost Colin Beveridge (@icecolbeveridge) had a bit of a rant about circle theorems. He feels they are pretty pointless, and he is in a fairly good position to discuss this, as he spent a decade researching the topology of the sun, basically circular in nature, and never used any of them. He says that he has only ever used one once, and that was to find the centre of a circle (this use is the most practical use if a circle theorem I can think of). The discussion came about because the other cohost, Dave Gale (@reflectivemaths) was talking about when he trained and the things he hadn’t encountered before. His experience reminded me very much of my own. While I was training to teach I was also working to ensure my subject knowledge was entirely up to scratch, and that I was familiar with the syllabus. There I discovered Circle Theorems, and they were pretty new to me. I don’t know if I’d ever been taught them, I did know that diameters make right angles at the circumference, and that chords make the same angle in the same segment, so I suppose I may have learned then forgotten them. The one in particular that I was certain I’d never met was “Alternate Segment Theorem”, infact it was something that at first confused me and I spent a long time investigating it during my PGCE year before I was completely satisfied that I understood it fully and could teach it. These Circle Theorems seem to stand alone in the syllabus, they seemingly have no direct link to any other area of the maths GCSE, and they certainly seem to have no real practical use at all and if there is an answer (other then “never”) to the question, “when will we ever use Alternative Segment Theorem in ‘real life’?” I’d love to here it! So, should we be bothering with them? The usual pro-circle theorem argument goes along these lines: “It’s a nice introduction to mathematical proof which gives students a good grounding for future proofs.” This doesn’t really wash with me. The questions we ask are not very stringent as far as proving goes and more often than not the teaching is focused around “this is how you get the marks on this question,” than any actual proof. However, I do feel that they have a place on the GCSE syllabus. I used to sit in the anti-circle theorem camp, but my views on this have changed. The more I get into circle theorems the more I love them. And the fact that they don’t have a point just adds to it. The circle theorems are beautiful. They show geometry at its finest, and they have been derived purely because someone wondered about the properties of a circle, not because there was a problem that needed fixing. Students should be exposed to this kind of maths. They should be allowed to investigate these theorems, and allowed to conjecture about them, before trying to prove them. I think they very definitely should stay in our syllabus, but that we need to address the way they are taught, and assessed. Take the mechanical nature away from the topic and allow the beauty of the maths to prevail.